LowChol Natural contains a combination of plant sterols including Beta Sitosterol. The ingredients contained in LowChol Natural have been clinically proven to improve total cholesterol and LDL (bad) cholesterol levels. 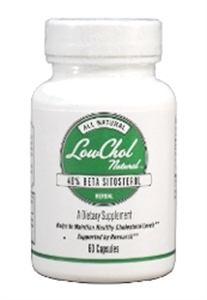 LowChol Natural contains a combination of plant sterols including Beta Sitosterol. The ingredients contained in LowChol Natural have been clinically proven to improve total cholesterol and LDL (bad) cholesterol levels. When plant sterols are consumed they prevent the dietary cholesterol from being absorbed in the intestines. They can also lower cholesterol by increasing the flow of bile acids which binds with cholesterol and is then excreted from the body. This product focuses on the dietary cholesterol we get from the foods we eat. For that reason it is a great supplement to use in combination with other cholesterol products like Red Yeast Rice (BioCor), BioCor+Q10, Pro BioCor and Delta Pro. The ingredients in LowChol Natural have been known to improve male prostate health by improving urinary flow and function.